It’s pretty rare for me to receive invitations for food-tasting session as I position myself as a travel blogger and I did hesitated before accepting. I wasn’t confident on how I could deliver the content as this is totally not my forte. In fact, before I started writing, I researched on the various writing styles for food-blogging. After thinking for a long while, I’ve decided to stick to my usual style of informal writing (as how I would have reviewed a restaurant overseas). To be honest, I am not extremely familiar with the rooftop dining scene in Singapore and I’ve not heard about Artemis prior to my visit. I went for the tasting session with absolutely no expectations and I’m glad to say that it was a very enjoyable and delectable experience. Mediterranean cuisine is the food from the lands around the Mediterranean Sea and its preparation. This geographical area broadly follows the distribution of the olive tree, which provides one of the most distinctive features of the region’s cooking, olive oil. FYI – countries surrounding the Mediterranean Sea includes Italy, France, Spain and Greece. Located on the 40th floor of CapitaGreen building (approximately 5 minutes walk from Raffles Place MRT), Artemis is in the heart of Singapore’s Central Business District. The restaurant is divided into two areas – alfresco/outdoor bar and an air-conditioned indoor dining. We were told to reach at 6:30PM, a perfect time to see the transistion of the city skyline into nightfall. The bar area was well-ventilated and super airy with a huge ceiling fan hanging from above. There was a wide variety of cocktails and I chose “The Grape Divine” which was a concoction of G’Vine Floraison, Rose Wine, Grapes and Berries. From the taste and the visuals, real grapes and berries were used. It was pretty light, perfect to pair with the Hors d’oeuvre (French word for Appetizers) that were served. Don’t you think that these look like Pokeballs? I have a strong feeling that the chef was probably not making any association with the Pokemon game. It was paired with a Spanish Sparkling Wine, Delapierre Cava Brut, NV. I personally enjoy watching sunsets and the changing colours of the sky and it was nice to identify familiar buildings (Like MBS) while staring at the city skyline. For a moment, all the #mondayblues were forgotten (Food tasting was on a Monday) and being able to chill and space out in front of such gorgeous views was really a blessing. As the sky darkens (approximately after 7:30PM), we were brought indoors for our actual meal. It was really sweet of them to prepare a printout menu for our reference. Each dish was paired with a differenty type of wine (Can’t really comment much as I don’t have much knowledge in this area). With my layman’s wine knowledge, all the wines served were easy to drink and pretty smooth to my liking. Similar to Italian restaurant dining, bread was served at the beginning. There were four types of bread (sorry I can’t remember the names) and my favourite was the white one (second from the right). The Olive Oil served was uniquely one-of-a-kind and the (black) dip contains this middle-eastern herb/spice known as Za’atar which gives it a special flavour. Note: If you can’t decide which bread to choose, you can always have one of each kind (and even extras if you really like). Also, butter is only served upon request. Ceviche is a seafood dish popular in the coastal regions of Mexico, Central America, Ecuador, Colombia, Chile and Perú and other parts of Latin America. Similar to its description above – this dish was like sashimi with lemon/lime for the citrus taste. It was paired with Italian wine, Claris-delle, Pinot Grigio 2015. The very tender medium-cooked loin was wrapped up Pancetta (some kind of bacom) which gives you 2 different layers of flavours when chewed together. The Patagonian toothfish, Dissostichus eleginoides, is a species of cod icefish found in cold waters (1–4 °C or 34–39 °F) between depths of 45 m (148 ft) and 3,850 m (12,631 ft) in the southern Atlantic, Pacific and Indian Oceans and Southern Ocean on seamounts and continental shelves around most sub-Antarctic islands. Artemis serves you.. nothing but the best. Red Comice Pear is known to be the pinnacle variety of pears and it is magically used for tarts and sorbet. It was my first time eating a pear tart and a pear sorbet! The muscat grapes enhanced the sweetness of the dish and it was paired with this salty crisp. It tasted awkward at the beginning and we were all wondering why was there savory crisps on a dessert dish. On a hindsight, the savory taste helped to smoothen out the sweetness, which makes the taste just nice. Dish was paired with white pot wine as a finale. Before we thought it was all over, we were presented with this assortment of pastries which was so damn memorable. 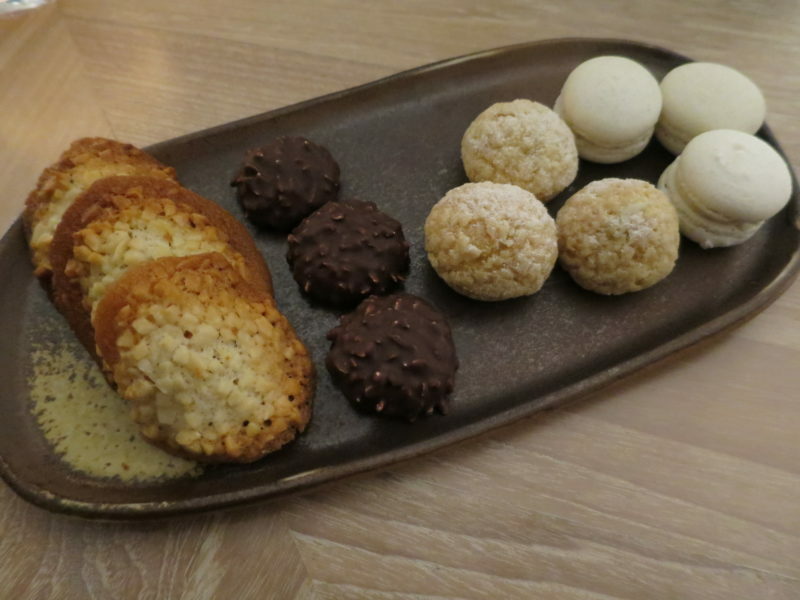 Especially the one on the right – cherry truffle macarons. Either we were tipsy from all that alcohol or it was so damn delicious. The sweet-savory harmony was a taste that lingered within me till the very end.. Sadly, these pastries are not in the menu and I’m not sure how and why they end up serving it. Well, if you ever get a chance to try it, you’ll understand why I can’t stop raving about the cherry truffle macarons (provided you are a fan of truffle). Every dish in ARTemis (FYI: Artemis is a name of a Greek Goddess) was plated like a piece of art. I’m pretty sure every sauce drizzle is carefully orchestrated. I guess this is the extra effort which makes up for the price. To be honest, this is not a cheap place that you can or should afford on a daily basis. It is an exquisite dining venue reserved for celebrations of special days and occassions, combining good food, great ambiance and service. Also, it is worth mentioning that the chef (Chef Fernando Arevalo) take pride in working with artisan suppliers who share the restaurant’s commitment to quality and sustainability, including meats that are grass-fed and hormone-free. Level 40, 138 Market Street, Singapore 048946. Nearest MRT is Raffles Place. Disclaimer: Writer was invited for a food tasting session.